Rosendale Waxworks is a candle and soap emporium, offering gifts and treasures that present the potential to completely transform a space and enhance a home. Shaun practices his latest outlet of art, inventing and producing new kinds of candles, in the shop’s front window. Here, he’ll be found widdling away at his latest projects, hand pouring wax and drawing up plans for his next venture. 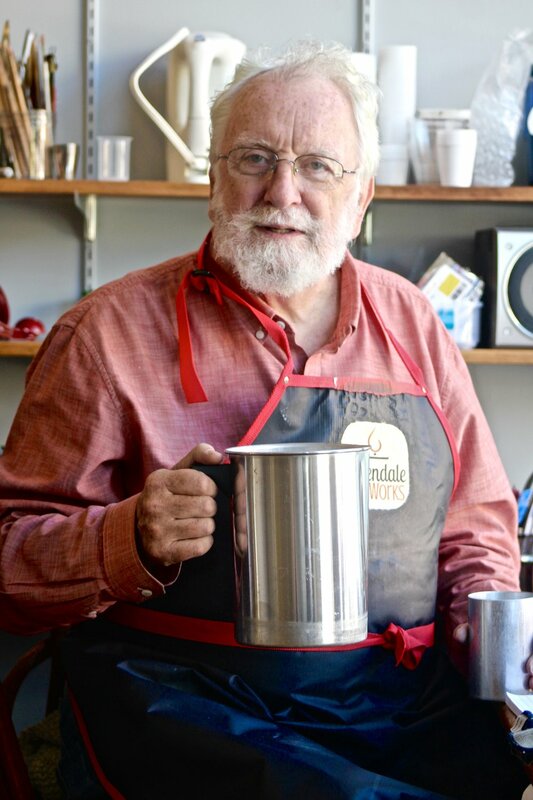 Passers-by on Rosendale’s charming Main Street will often find him in his candle-making corner; the perfect space to share his newest discoveries with them. The making of candles itself is a skill that traces back thousands of years. Especially in medieval times, the trade of chandlery (candle making) was vitally important to kingdoms and villages. 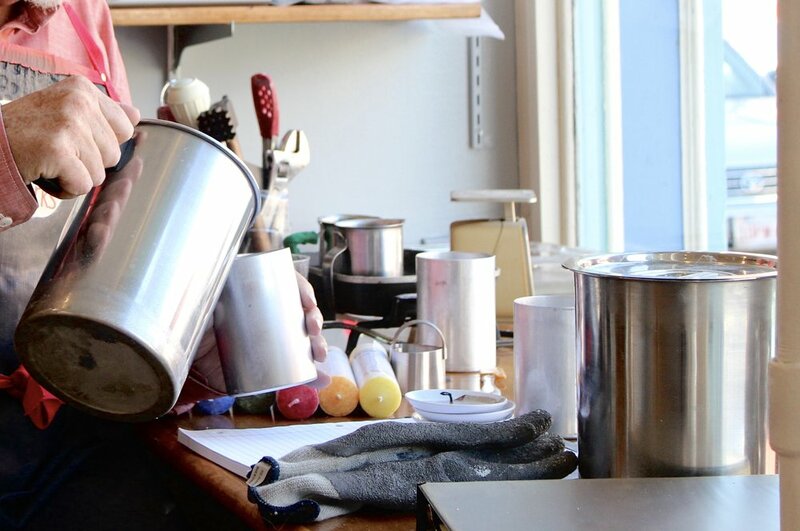 While candles are not a necessity in today’s world, the art of candle making is a skill that offers it’s maker the ability to revolutionize a setting. It starts with finding the right wax. A pouring pot to bring your wax to the perfect temperature. Wax in it’s raw, liquid form untouched by fragrance oils or dyes. I’m not so much interested in candles for how they smell, I’m more interested in how they look and what they can do. I’ve had several hobbies involving art and photography and I’ve been a professional graphic designer, so I can bring those skills to making candles look good. But at heart, I’m a frustrated industrial designer—I want to make new kinds of candles, kinds you’ve never seen before. Sitting in our shop window I’m surrounded by tools and materials. I wave at passersby, they wave back. In the past I’ve always practiced my hobbies alone, now I get to make candles and soaps in public and I love it. I fell under the spell of wax only recently, in the Fall of 2017. There are many different kinds such as palm wax, coconut wax, beeswax, soy, gel, many different kinds of paraffin wax, and a wide variety of blends. One of my favorites is a blend of coconut and apricot wax. Each kind has its own distinct properties. As if that wasn’t enough, there are different kinds of wicks to use with them, and different kinds of containers. Just now I’m playing with molding and casting materials. The toys just keep on coming! Coming up with a new candle can start with the wax, with coming across a new container, with discovering something new to make a mold of, or with dreaming up a new kind of candle. There’s really no standard way to go about making it. The tools and the materials tell you what to do. When they say, you can’t do that, you figure out some other way. It’s a wonderful blend of art and craft. Best of all, what I make goes out the door, I’m not just adding more works of art to an already cluttered basement. How much is a candle worth? Does it matter how long it lasts? When people ask me how long a particular candle lasts I say, longer than you’ll stay interested in it. When it’s burned down a-ways, you’ll get bored with it, toss it away and get a new one. What you’re buying is not just wax, it’s the magic of celebrating a link with our past, when people had nothing but candles to brighten their evenings. There’s magic in the light from a candle. The flame, in some way that matters, is alive, as we are. When we light a candle we’re celebrating what makes us special.